NB: This system is under active development. If you come across any bugs or problems, please do let us know so that we can fix them. 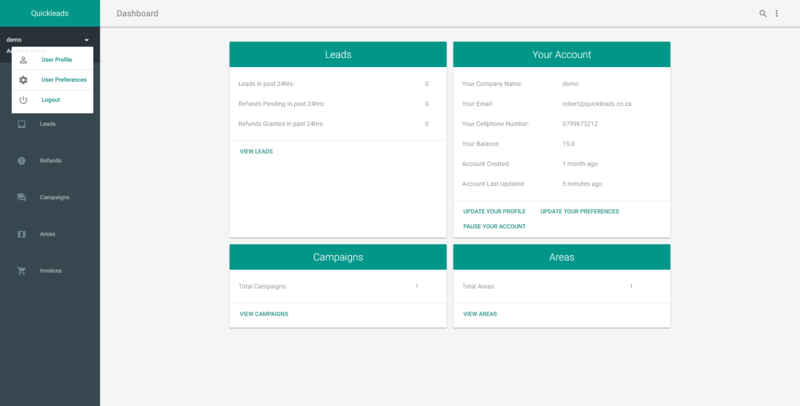 Invoices – Get More Leads! For new users, you set up your log in credentials when registering your account. If you receive an error message when registering that your username or email address has already been taken, please refer to the steps below. 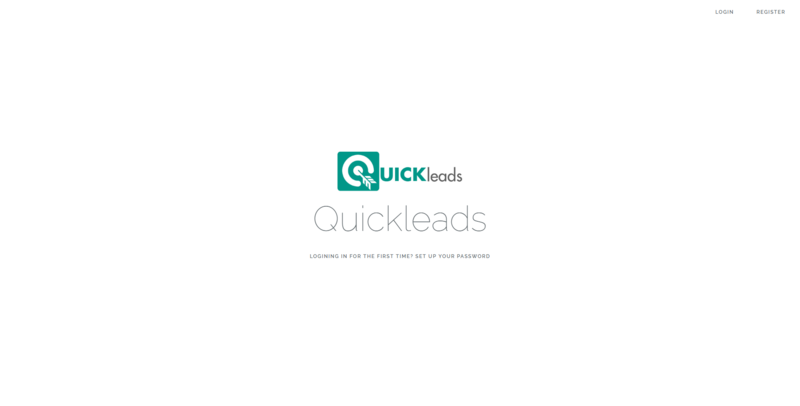 For most existing users (those who have received leads from us before), an account will have been automatically created for you by Quickleads. These accounts are created with random passwords for security reasons. Even Quickleads does not know this password. In order to be able to log in to our lead distribution system, you will need to follow the steps outlined below. In the following screen, you will be asked for your email address. This is the email address that leads currently get sent to, or that you get invoices to if you have never received leads from us yet. 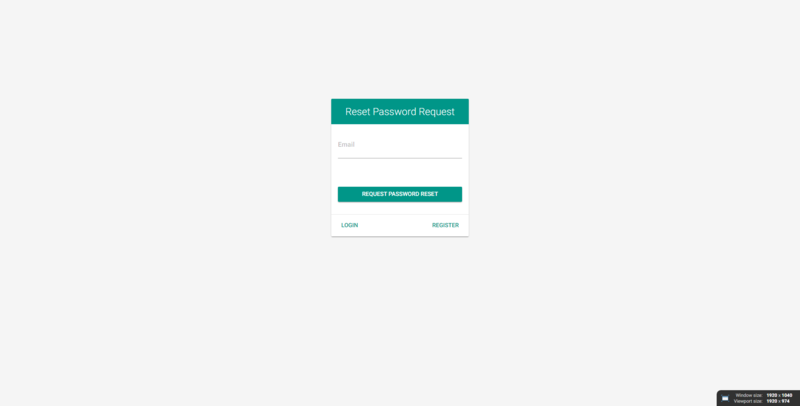 Enter your email address, and hit the “Request Password Reset” button. 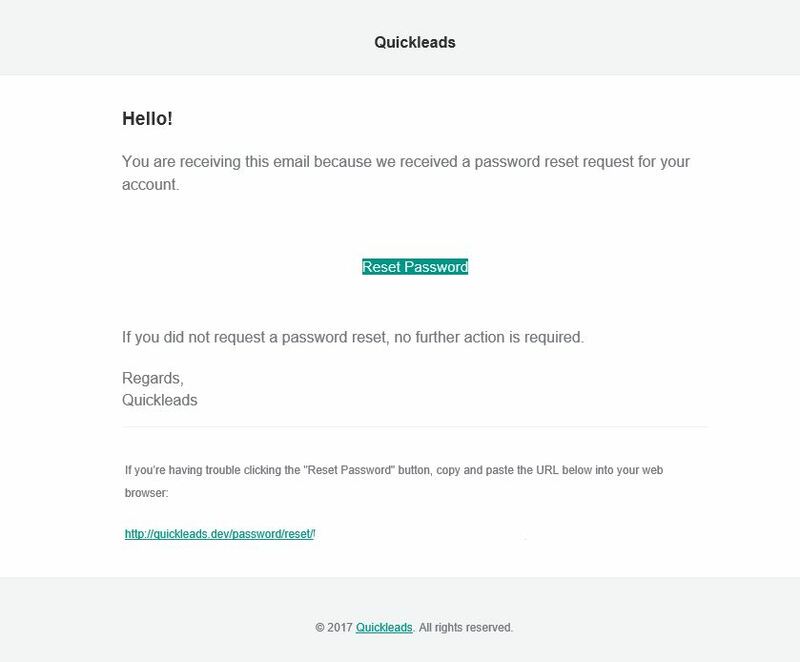 An email will be sent to you, with a link to reset your password. Click that link, and follow the on screen steps to enter a new password of your choosing. Update your profile (more about this a little lower down the page). Simply click the “Update Your Profile” button. Update your preferences (more about this a little lower down the page). Simply click the “Update Your Preferences” button. Pause or Resume your account. You can pause your lead service at any time (for example you are going away for the weekend) and provided you have a positive credit balance, you can resume your account at any time if it’s paused. Simply click the “Pause Your Account” or “Resume Your Account” button. As mentioned above, we also allow you to update your profile and preferences at any time. It’s a great idea to ensure your profile settings are correct and up to date when you first log in. There are two ways to get to the profile and preferences pages. Instructions are outlined below. Or you can click the drop down arrow next to your user name near the top of the navigation menu on the left. If you are on mobile, you will need to click the menu button on the top left of the screen (looks like three horizontal lines) in order to see the navigation menu. 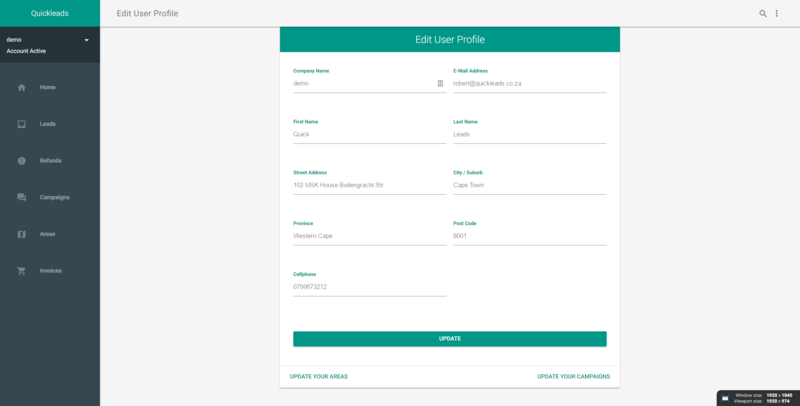 The User Profile page will show all the details we have on our system for you including company name, email address, first and last name, address and cellphone number. Several of these details will be displayed to your leads when they request quotes, so please ensure they are correct so that the leads can reach you if necessary. The email and cellphone details here are used to send leads to. If they are not correct, you will not receive your leads. 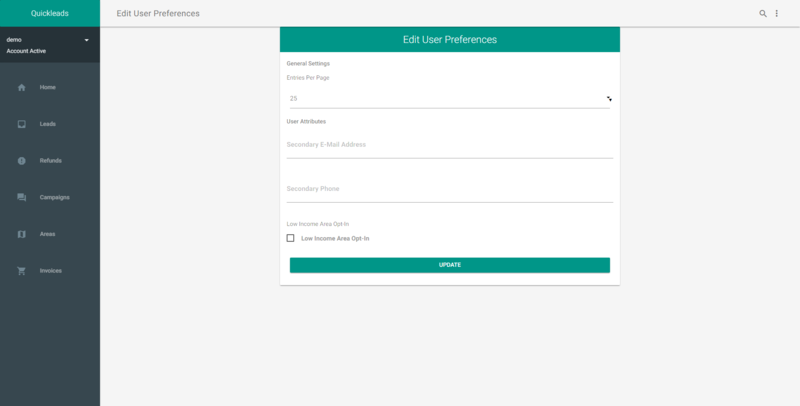 The user preferences page allows you to change how many leads should be displayed per page when viewing them in the customer portal. Importantly, you can also add a second cellphone number and email address to your account here. NB: The final option on the user preferences page is an opt-in for what we call “Low Income Area” Leads. As part of our commitment to continued quality, Quickleads has identified a significant list of low income areas, and by default we block any leads from these areas from reaching our lead buyers. We now offer you the option to unblock these leads. We believe these leads could still be of significant benefit to you for the following reasons. Low Income Area Leads will be sold at half price. In other words, if a lead would normally cost 1 credit, we will only deduct 0.5 credits from your account for a Low Income Area lead. This means you could get twice as many leads for your money! Low Income Area Leads have less competition from other lead buyers. While we aim to deliver most leads to up to 4 companies at a time, the Low Income Area Leads require an opt-in from our buyers before they are received. This means there are less lead buyers who will receive these leads, and it could well be the case that you will be the only one to receive some of these leads. That means a higher chance of closing the deal for you! Possible the most important section of the portal is the view where you can see your leads. To get there, click on the “Leads” menu item in the menu on the left. If you are on mobile, you will need to click the menu button on the top left of the screen (looks like three horizontal lines) in order to see the navigation menu. This page will allow you to take a few actions. At the top of the page you will see a bar with a few options. 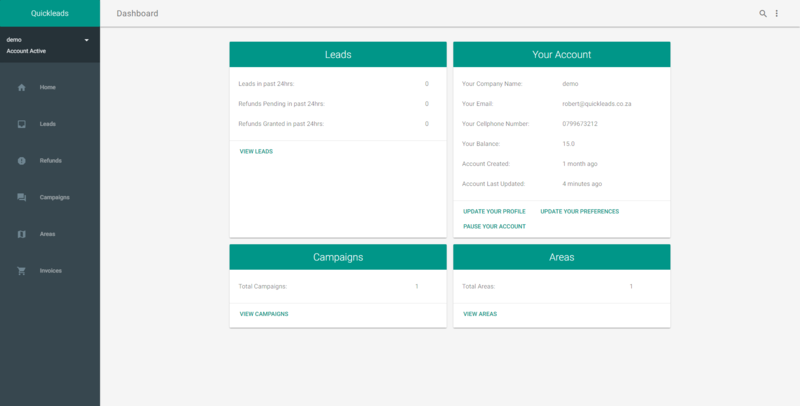 You can set how many leads to show per page, you can filter the view by campaign or area. This is useful if you want to get a quick idea of how many leads of certain type you have received to date. These settings get saved when you click “Update” so it’s important to remember to set them back to “Disabled” again if you want to see all your leads. Below these settings, you can see all your leads with the most important details about them. To see more details about the leads, click the “Details” button. You can also apply for a refund for a lead by clicking the “Apply For Refund” button. This will take you to a brief form to complete to explain why you think the lead should be refunded. Please note Quickleads has strict policies on what leads are eligible for refunds. Once you apply for a refund, you will have the option to cancel the refund request. 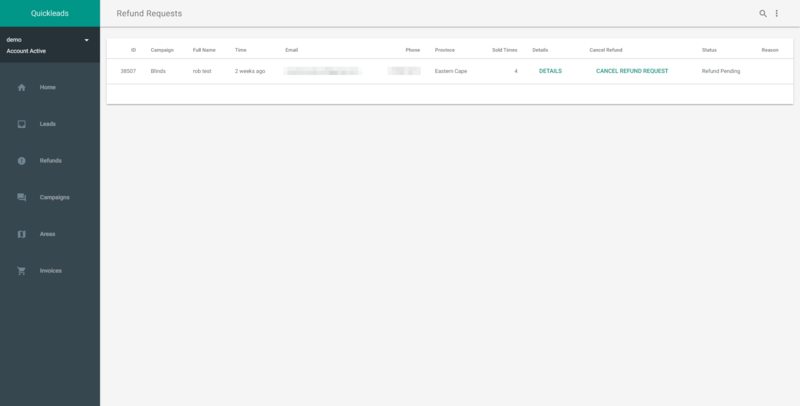 The status of the refund request will also show up in the status column on the leads page. We aim to respond to refund requests within 48 hours. You can quickly view any pending refunds on the refunds page. 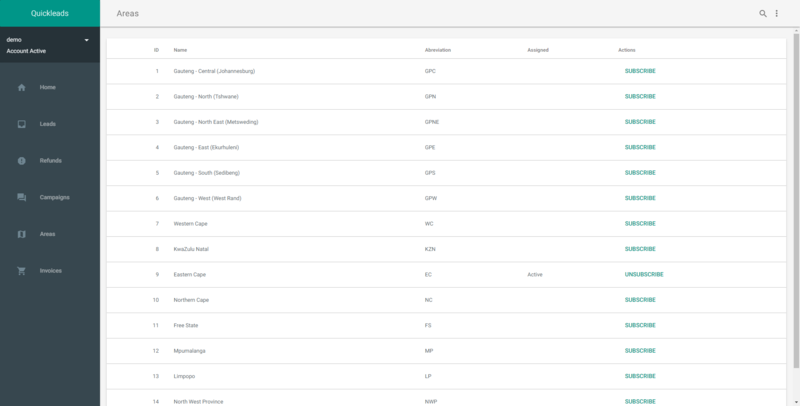 The Campaigns page lets you view and change any industries you are subscribed to. Industries that you are currently subscribed to will be shown with an “Active” comment, and the button to subscribe to that industry will be changed to an “Unsubscribe” button. To subscribe to a new industry, simply click the “Subscribe” button. To unsubscribe from an industry, simply click the “Unsubscribe” button. The Areas page works in the same way as the Campaigns page. Simply subscribe or unsubscribe to any areas you would like to get leads in. NB: We currently focus most of our marketing efforts in Gauteng, Western Cape and KwaZulu-Natal. We do get leads in other areas, but in smaller amounts. Lastly, the invoices page. This page relies on an external invoicing service, so may take a little longer to load. 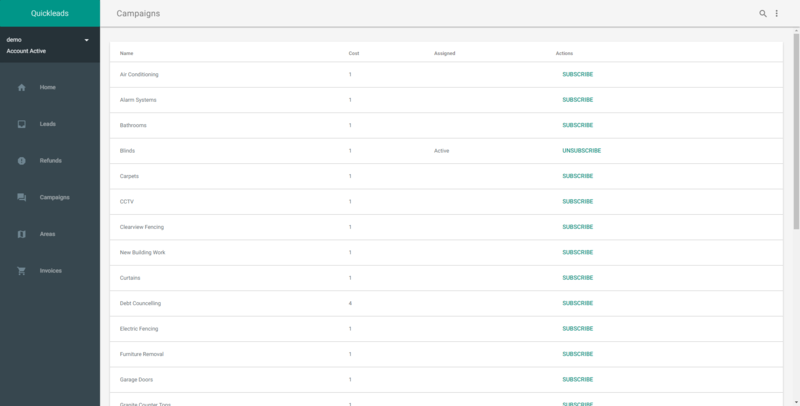 The invoices page can be used to see a history of all your invoices, as well as their status (voided, paid etc). You can also use the buttons at the top to request a new invoice. At the top of the page you will see some buttons to request a new invoice. Please be patient when clicking these buttons, as it can take a short while to generate an invoice for you. Clicking the button multiple times may trigger multiple invoices to be sent. 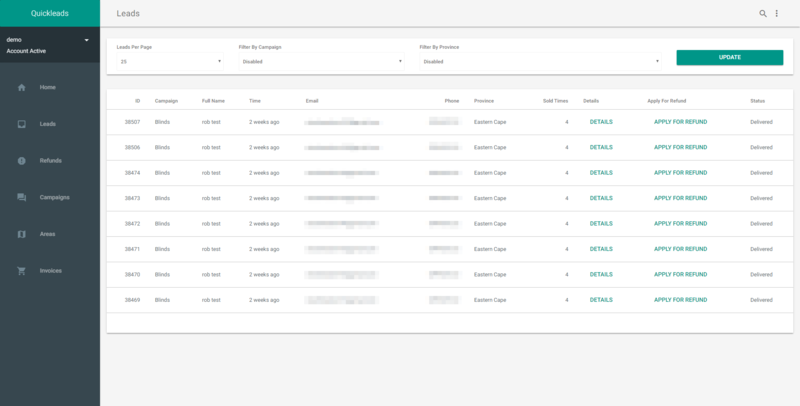 Below the buttons to request new invoices, you have a few options to change how many invoices to show per page, the sort order of the invoices, and to filter by invoice status. These settings get saved when you click “Update” so it’s important to remember to set them back to “Disabled” again if you want to see all your invoices. Below these settings, you should see a list of all your invoices. If you do not see invoices there, please email us so we can look into the problem. 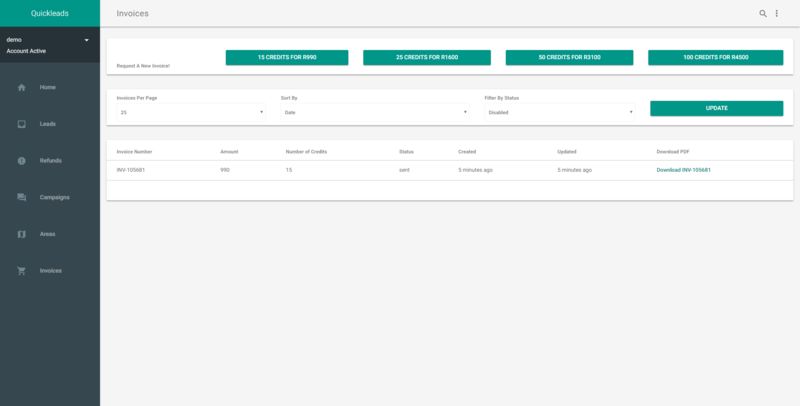 For your convenience, you can see when an invoice was created, when it was updated (usually when the status was changed to paid or void), and we provide you with a link to be able to download a copy of the invoice.